The food service is a massive industry and is prospering at a remarkable speed. Corporate events, parties, functions etc have become an indispensable part of the modern lifestyle. Catering is a common term and is basically the business of food preparation and serving drinks and food to the guests or customers. The hotels, restaurants and canteens are associated with large scale catering. It is also seen in cafes, coffee shops etc. Event catering is on a massive scale and in this food is served by the caterers at the pre decided venues. In such situations the food items are usually prepared on location itself and are presented to the guests through buffets else served by the staff. This is easily seen at conventions, functions and weddings and they are called as catered events. For making the whole scenario a success efficient and muti utility equipments are desirable and Catering Trolleys in Australia occupies a prominent place in this. These are used for commercial purpose and are of tremendous help in serving and presentation of dishes. These are manufactured by the company dealing with advanced equipments. These are designed on the latest lines and are stylish and practical. Some of the renowned models include 16 tray Food Tray Dispenser. This supports a capacity of 16 trays, has powdered coating finish and is provided with a push handle for ease. The 150mm castor and the corner buffers add to their functional aspect. Another is the 2 shelf tray cleaning trolley which is equipped with the push handles at both the ends and has 2 strong shelves that are lipped up. They have fine quality rubber swivel castors and optional powder coating can be according to requirement. Several other varieties are available and choice can be made as per the necessity. One of the popular models is the Tall Boy Trolley which is popular because of its attractive features like toughness and durability. This is due to the plastic capsule that is roto moulded and is built up on a weighty plate of steel base. It has blue castors of 150mm and made up of rubber. These are ideal for withstanding the rough handlings of the operators. It’s easy maintenance and the design which is ergonomic makes it highly desirable for the handling of laundry. This unique sturdy range made up of plastic also has an added rising base of coil spring. This eradicates the requirement of bending again and again while carrying out the tasks of loading and unloading. Some of the options that can be included to suit the customer’s requirements are namely, shelving, vinyl covers, the color or the logo of the respective company and the castor configuration that can be personalized. This optimum quality product is fully equipped to take care of the laundry based operations. d employing the advanced technological methods. Stainless Steel material is the standard that is used in a variety of equipment. It is the first choice of material, equipment across the world because of its various advantages. The most important point to note is that this material is easy to clean and is disinfected. Equipment Used: Stainless Steel is used in various kinds of medical equipment. It is used to make handling equipment that includes stainless steel trolley cart , sinks, cupboard, sanitizers etc. Furniture like: chairs, lockers, beds, tables etc. Maintenance like: bed pans, trash cans, hospitals use steel buckets and a lot more. Surgical Instruments: Most of the surgical instruments are made with stainless steel, or a similar alloy. Kitchen Equipment: Steel equipment is used widely in hospital kitchens and different kinds of trolleys are used to transport the food from the kitchen to the patients in their rooms. The main reason of using such material equipment is that they are hygienic, thus uses in the medical industry. These are corrosion and heat resistance and have a smooth finish. Using stainless steel in medical and home application is cost-effective and reusable. It also has a very high strength-weight ratio. The material handling tool is the core foundation of every well-organised and protective industrialised process. Furthermore, their existence in any loading or moving task makes work simpler and faster. Material managing equipment act as a finer solution for all kinds of industries including profit-making, domestic, manufacturing, retail and many more. Every technology’s chief goal is to make the life of humans more and more contented. When mentioning of materials handling gear, we chiefly talk of trolleys. Nowadays, we have many refined tools than we had ten years ago. There are trolleys intended principally for explicit functions to make the functioning smooth and proficient. 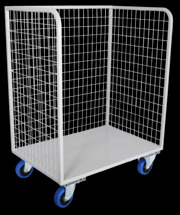 The linen trolley suppliers make the trolleys highly robust and of sturdy material that can take heavy loads. These trolleys at the same time are light-weight and easy to clean. Also, they are engineered in a manner to make them very resourceful with the application of smallest effort. There are various kinds of trolleys that are used in diverse industrial sectors, meeting the terms of each sector. The finest and the prominent part about the linen trolley suppliers is the utmost quality product they offer and standards of the support they present. They provide the facilities of movement, management of material goods and products all through the process of allotment, manufacturing, import, export. Soiled Linen Trolley is one of the best handling equipment having foot-operated cap, stainless steel finish, carry bag, robust frivolous structure, and many more features etc. Soiled Linen Trolley & industrial laundry tools are much required as they make the work trouble-free and take less time to operate. There are many companies which specialize in customized trollies of any size and shape to suit your requirement for any industrial applications. The design and fabrication of custom trolley is highly taken care of by these companies. Whether you desire high quality stainless steel or highly durable plastic trolleys, you can get them as per your expectations and needs. The vast range of trolleys is made available only after they pass high standard tests. From the many companies’ available, Advance Engineering is one trusted brand where high quality trolleys are made to do your job efficiently and effectively. If you are looking for trolleys for industrial and catering purpose, then you must go for stainless steel ones. These offer many advantages because of the material these are made from. Steel and chromium is used for their manufacturing which makes them rust free and stain proof. Most of the company’s powder coats your trolleys in a way that these blend well with your company logo and application. These can also be used for promotional purposes when you your logo printed on them. 1) Consultation: The expert consultant of the company, you choose consult with you to discuss about the various trolley solutions and material that shall suit best for your requirement. 2) Design: Designers work closely with the clients to get an idea what they have in mind before they finalize the design. The design varies according to the requirements put forward by you. 3) Manufacture: According to the design, these are manufactured and delivered at the job site. Advance Engineering is specialists in custom trolley manufacture and design in Australia.